, s s toggles between a Clojure code file buffer and the REPL buffer, opening the REPL buffer where required. , s n evaluates the namespace of the current Clojure file in the REPL, changing the REPL to be in that namespace. Many developers simply evaluate functions and expressions within the Clojure code buffer itself. A REPL buffer is very useful for showing larger results from evaluating code and any side effect information such as logging and debugging. SPC SPC cider-repl-set-ns displays a pop-up buffer of all the available namespaces. A running REPL is required. When starting a REPL the default namespace is called user. This namespace contains the clojure.repl library allowing you to call functions useful for development, such as (doc ,,,), (source ,,,), etc. 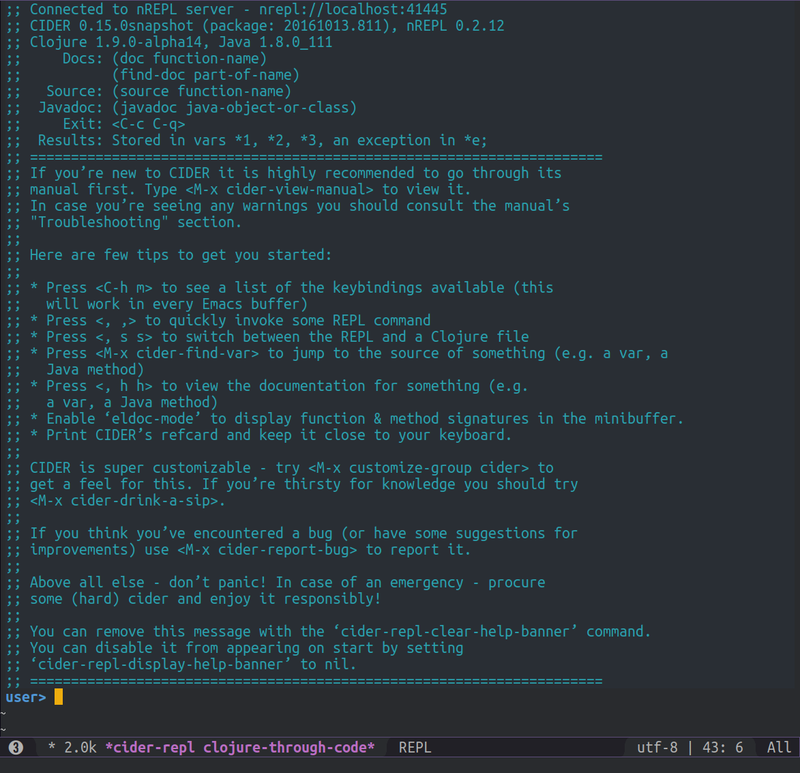 , s S * M-RET s S * cider-repl-set-ns * Proposed change: Select a namespace and switch to it. The REPL buffer contains a detailed welcome message describing how to use the basics of the REPL.